At the Art Basel spectacle in Miami last week, heavy rains swamped the parties, forcing fairgoers to prance through the streets in soggy stilettos. It wasn’t a freak occurrence. It was a peek at the future. 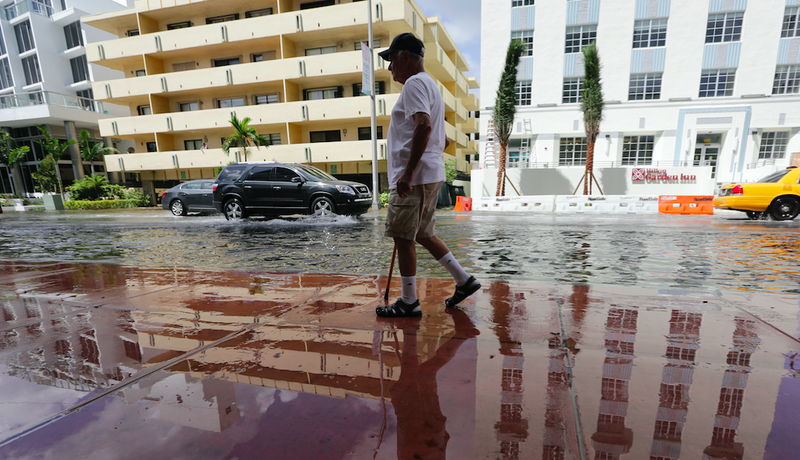 To cope with its recurrent flooding, Miami Beach has already spent something like a hundred million dollars. It is planning on spending several hundred million more. Such efforts are, in Wanless’s view, so much money down the drain. Sooner or later—and probably sooner—the city will have too much water to deal with. Even before that happens, Wanless believes, insurers will stop selling policies on the luxury condos that line Biscayne Bay. Banks will stop writing mortgages. All of this wouldn’t be as much of a concern if it weren’t for the unique geological foundation beneath the city: A porous limestone which is—surprise!—already filled with water. One resident puts it this way: The water comes from six sides. The water is rising so fast that infrastructural solutions can’t be rolled out quickly enough. Residents buy pumps that are quickly overwhelmed. Streets are raised a few feet, but the water catches up. Cities like Venice and New Orleans are experimenting with a series of sea walls and pneumatic gates to keep high tides out. Mowry said he was intrigued by the possibility of finding some kind of resin that could be injected into the limestone. The resin would fill the holes, then set to form a seal. Or, he suggested, perhaps one day the city would require that builders, before constructing a house, lay a waterproof shield underneath it, the way a camper spreads a tarp under a tent. Or maybe some sort of clay could be pumped into the ground that would ooze out and fill the interstices. Or they could just move the entirety of Miami Beach. Either option sounds expensive. And scary.